The snow fell heavily last night after an initial hailstorm started things off. This morning there was two inches (~5 cm) of snow on the ground. I went out for a short drive into West Bragg. I missed the Great gray owl that a couple of photographer friends watched this morning. This mother White-tailed deer and her two fawns along the edge of the snowy forest made up for that though. This entry was posted on March 25, 2016 by Christopher Martin. 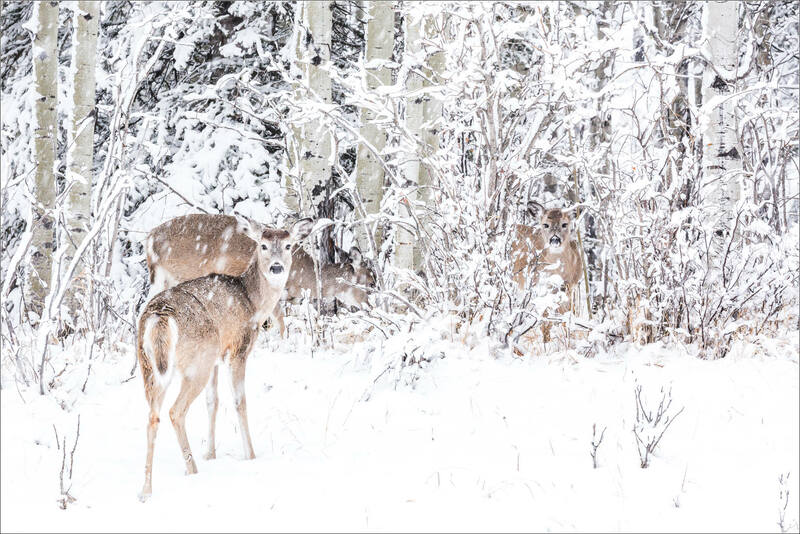 It was filed under Alberta, Bragg Creek, Deer, Wildlife and was tagged with alberta, bragg creek, Canada, deer, fawn, forest, snow, spring, white-tailed deer. That photo really takes you to another world. Love! So beautiful and special. what a show of the Nature !!! Thank you Rajiv – very kind. Have a great day!